Animal Defenders International : Animal rescues : Help send them home! ADI now has all the permits in place to fly the 33 lions ADI has rescued from circuses in Peru and Colombia home to a new life in a safe sanctuary in South Africa – Emoya Big Cat Sanctuary. 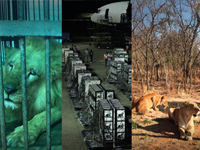 To fly the 33 lions home will cost 330,000/£230,000, for the flight – $10,000/£7,000 ticket for each lion! Timing is critical, with the price based on where the aircraft is, the day before we need it – e.g. if it comes from Canada it would cost much more than if it came from Chile. So we’ve given the cargo companies as much notice as possible and need as many options as possible. Our travel crates are ready but there’s a lot to do! Check out our sponsorship packages ranging from $100/£70 right up to supporting a lion’s entire airfare $10,000/£7,000. Get together with friends to get involved or simply give what you can – everything helps.